Could we see all four 100 foot yachts fighting each other up a sulky Derwent River on Wednesday night? That tantalising climax of the race for line honours has been more than hinted at by the weather patterns taking shape in the Rolex Sydney Hobart Yacht Race over the next few days. The docks of the Cruising Yacht Club of Australia are awash with Americans - we always get some for the Rolex Sydney Hobart - but this year there are five American yachts: Christopher Dragon, Dorade, Wizard, Triple Lindy and Warrior Won, not to mention the North American stowaways on Sir Robin Knox Johnston’s 11- strong Clipper Fleet. 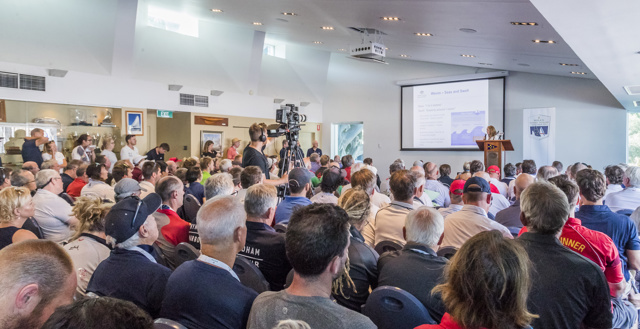 View the Rolex Sydney Hobart Yacht Race competitors race briefing, held at the Cruising Yacht Club of Australia on Sunday, 24 December 2017.
Who will win the Tattersall Cup? It is just three days to the start of the 2017 Rolex Sydney Hobart, so of course it is time for the bar-room pundits to start speculating about who will take out Australian yachting’s most prized trophy, the Tattersall Cup for the overall winner on handicap - everyone has a theory - everyone has a favourite. Sixteen wounded, injured and ill defence personnel and veterans were announced today as the Invictus Games Sydney 2018 crews for the Rolex Sydney Hobart Yacht Race 2017. Comfy she is not - in her 40 foot hull Imalizard boasts no floor, no shower, no windows, no table other than a small chart table and even that, in these days of electronic charts, is barely used, while sails are stacked on the bottom of the boat - it does have a toilet though, a luxury that owner Bruce Watson concedes is required by the rules of the Rolex Sydney Hobart. With just days until the Boxing Day start of the Rolex Sydney Hobart Yacht Race (RSHYR), registrations have been mounting for what will be the blue water classic’s first year of partnership with Virtual Regatta, the world's leader in cutting edge sailing simulation games. He is not entirely sure because they don’t keep records of these things, but when Bill Wheeler steers his Beneteau 57 Vanishing Point across the line he thinks he could have set a new Rolex Sydney Hobart race record. The Bureau of Meteorology has given the 2017 Rolex Sydney Hobart fleet an early Christmas present - speaking at the Cruising Yacht Club of Australia this morning, Bureau of Meteorology’s Manager, Weather Services NSW, Jane Golding, delivered a forecast that points to a fast, mostly broad reaching and running race. Rolex Sydney Hobart: Preview con Mascalzone Latino! There are a lot of drop-dead gorgeous racing boats in this year’s Rolex Sydney Hobart, but on Boxing Day keep an eye out for a bright red timber boat from Adelaide called Enchantress. Wild Oats XI is a maxi yacht most famous for being eight-time line honours winner of the Rolex Sydney Hobart Yacht Race. The yacht’s success is renowned, thanks in part to its skipper, Australian Mark Richards, who has been at the helm for over ten years and knows this offshore classic well. High seas and powerful winds make the 628-nautical mile course from Sydney to Hobart a formidable challenge for any sailor. For Richards, there is no place in the world he would rather be. The crew that wins overall takes home the coveted Tattersall’s Cup, with its many years of history, and a Rolex Oyster Perpetual timepiece, engraved with the race name, the year and the words “Overall Winner”. The Oatley family’s champion Rolex Sydney to Hobart yacht race supermaxi, Wild Oats XI, is at the centre of a frenetic repair schedule after it was struck by lightning at the weekend. With just a week to go to the start of the 2017 Rolex Sydney Hobart, the pressure is building on everyone to get their boats fully prepared, the crew working as a team and every last wrinkle ironed out, especially for the 28 international boats. Pay attention - it all gets a bit complicated - Bob Steel won the Cruising Yacht Club of Australia’s Rolex Sydney Hobart in 2008 on his TP52 Quest, and he had already won the race once before, in 2002, on a different boat also named Quest. Mark Hipgrave - Mister Lucky - or not? When the start cannon fires on Boxing Day, Queensland entries headed south will number 11 in the Cruising Yacht Club of Australia’s 2017 Rolex Sydney Hobart Yacht Race, but one is a little more unusual than the rest – a boat full of people who stand out because they are known as solo sailors. In 2012, at the age of 58, well known Cruising Yacht Club of Australia offshore racer Warwick Sherman contested his first Sydney Hobart - it was on his bucket list after being diagnosed with non-Hodgkin mantle cell lymphoma in June 2010. “Line Honours is all that matters,” so declared the man who will steer one of the very last boats to cross the finish line in the Cruising Yacht Club of Australia’s Rolex Sydney Hobart Yacht Race this year, as he has done six times previously. Yes, I know you can fly there for starters, but in the last week of the year for a surprising number of people, the only way to get to the Apple Isle of Tasmania is by racing boat, but even then, there are an amazing number of options in the Cruising Yacht Club of Australia’s 628 nautical mile race. The 2015 Rolex Sydney Hobart line honours victor, LDV Comanche, was yesterday purchased by Sydney’s Jim Cooney from its American owner Jim Clark, meaning there will be a gathering of four Australian owned super maxis on the start line of the Cruising Yacht Club of Australia’s classic when it starts on Boxing Day. This year Tony Ellis will become just the second person ever to compete in 50 Sydney Hobart races when the fleet departs the Cruising Yacht Club of Australia on Boxing Day – and he will be just one Hobart shy of Tony Cable, who has raced south a record 51 times. Peter Harburg's Black Jack takes the honours in a close contest with Wild Oats XI, with Karl Kowk's Botin 80 Beau Geste third. Former America's Cup-winning skipper James Spithill has his sights on a race record with LDV Comanche in this year's Rolex Sydney Hobart. Invictus Games Sydney 2018 will set sail in the fleet for the 2017 Rolex Sydney Hobart Yacht Race. An Australian crew will steer a course for Hobart aboard Invictus Games Sydney 2018 DOWN UNDER with a UK Crew aboard Invictus Games Sydney 2018 GAME ON in what’s tipped to be an ‘Ashes on the Water’. The penultimate race of the CYCA's Blue Water Pointscore is the Bird Island with the Rolex Sydney Hobart the final test. Back in for Race 5 is the famous American classic wooden boat Dorade. With her deep keel, narrow beam and generous sail plan, the yawl took the yachting world by storm and made headlines around the world after scoring an upset victory in the 1931 Transatlantic Race from Newport, Rhode Island to Plymouth, competing against much larger boats. Dorade went on to score famous victories in some of the world's most famous races- now she takes on the Rolex Sydney Hobart with Adrienne Cahalan, the first woman to sail 25 Hobarts, navigating. The Rolex Sydney Hobart Yacht Race 2017 promises to be yet another blockbuster. 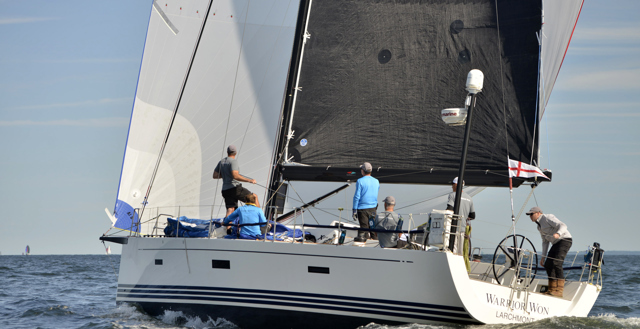 The 73rd running of the Cruising Yacht Club of Australia’s 628 nautical mile blue water classic has attracted 107 yachts, including a record 30 internationals, four supermaxis and some of the greatest names associated with ocean racing. November 1 is the start of Movember, the annual men’s health awareness campaign and fundraiser, and both the delivery and Rolex Sydney Hobart race crew of Kialoa II are getting into the 70s vibe in anticipation of the 73-footer’s arrival into Sydney at the end of the month. Last year’s overall winner and the record-breaking line honours victor are among the quality 110 entries, including a record 31 internationals, received by the Cruising Yacht Club of Australia (CYCA) for the 2017 Rolex Sydney Hobart Yacht Race which starts at 1pm on Boxing Day. A double win in her opening race has Matt Allen’s brand new Ichi Ban firming up as a favourite for the upcoming Rolex Sydney Hobart when the Cruising Yacht Club of Australia’s 628 nautical mile race starts on Boxing Day. Kialoa II has completed the Rolex Fastnet Race and will soon hoist sails and head to Sydney, Australia, and the second major goal for the owners Patrick and Keith Broughton, the Rolex Sydney Hobart Yacht Race (RSHYR) starting from Sydney Harbour on December 26, 2017. Two-time America’s Cup challenger, Vincenzo Onorato, is among the seven early international contenders for the Cruising Yacht Club of Australia’s (CYCA) 2017 Rolex Sydney Hobart Yacht Race. 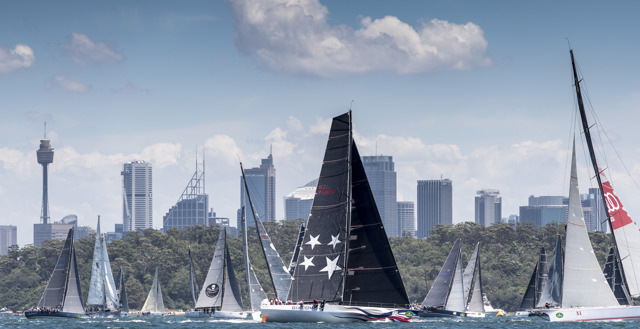 16 entries in 24 hours kicked off a busy start to proceedings following the release of the Notice of Race for the 73rd Rolex Sydney Hobart Yacht Race (RSHYR) at the end of June. The Cruising Yacht Club of Australia (CYCA) has released the Notice of Race for the Rolex Sydney Hobart Yacht Race 2017, inviting eligible yacht owners to enter what is one of the world’s toughest offshore racing challenges.